Spotted crake Porzana porzana, from here. 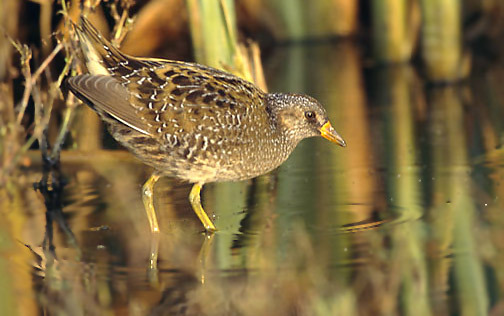 Porzana is one of the primary genera of crakes, short-billed rails without significant aquatic adaptations (Livezey 1998). The phylogenetic analysis of Livezey (1998) indicated that the species included in Porzana form a paraphyletic grade within which are nested more derived aquatic groups such as the coots (Fulica) and moorhens (Gallinula). [L98] Livezey, B. C. 1998. A phylogenetic analysis of the Gruiformes (Aves) based on morphological characters, with an emphasis on the rails (Rallidae). Philosophical Transactions of the Royal Society of London Series B – Biological Sciences 353: 2077-2151.